2: The End Of Much Of The World That We Knew. It’s here at last–all our vague hopes of my being able to stay out are gone; I feel sure that I will be called by summer, though not before the end of the semester, certainly. I still refuse to volunteer, though there are some boys here who are going to. It’s hard on you girls, I know; the delay in my education can do none of us any good; I wish I could be there just to talk it over with you. Needless to say, it leaves me very low–I had been hoping against hope that it would never come; it may well mean the end of much of the world that we knew. But there’s nothing we can do about it now. This doesn’t key in with the above, but I know that you will be glad to hear that Rusty is at last coming on–next Saturday for the annual law school dance, staying until Monday night. I felt on top of the world about that, as you can imagine. The attack on Pearl Harbor swept the nation in to a frenzy of patriotic fervor, and the Yale campus was no exception. ROTC cadets looked a little sharper in their uniforms. Graduate students labored over applications for officer training. Devotees of Yale aviation history dreamed about tangling with Zeros over the Pacific. And one junior editorialist noted that Harvard was instituting a physical training program to get her young men fit for service–surely Yale should do the same! Had the Law School been asked to list its most likely candidates for the service, Phil Wood might have found himself towards the end of the roster. He was studious and sharp, but his ectomorphic stature limited his physical abilities to managing a track team. Furthermore, he was an avowed pacifist. His parents had treated wounded soldiers in the Great War while his uncle fought at the Argonne; their stories convinced young Phil that “if one tenth as much money and effort was spend on peacetime good works as on war, then there would be no need for war.” He loved to argue the point with interventionist friends, and during his tenure at Swarthmore volunteered for peacekeeping missions sponsored by the town’s strong Quaker population. However, Phil was a proud young man, and all of twenty-one years old. His sister Gretchen would later explain that, knowing he would have to serve eventually, Phil chose to meet the problem head-on. He may have attended some discussions about the various services on campus; if so, one in particular must have stood out. 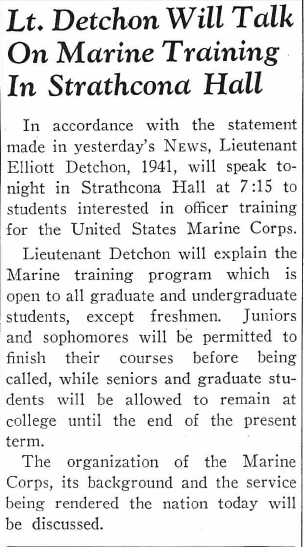 Lieutenant Detchon’s talk took place on February 10, 1942. The following day, Phil Wood filled out an application for Marine Officer Candidates’ School. It would take some time to procure the proper references and recommendations–but the wheels were set in motion. In the meantime, there were his studies to consider–and of course, entertaining his favorite young lady, Miss Anne Shaw Davis. Recorded by GWW as December 7, 1941, but probably written in February, 1942. Possibly a reference to impending selective service; the Yale Daily News reports that all eligible students and faculty (ages 20-45) were to register by February 9, 1942. Despite Phil’s protests about “refusing to volunteer,” his application to Marine Officer Candidates’ School is dated February 11 and he gathered the necessary recommendations in the weeks that followed. “Rusty” is Anne Shaw Davis (18 September 1919 – 2 January 2015), Phil’s long-time girlfriend, so called for her red hair. They met on the train to Swarthmore College in 1937, and began dating shortly thereafter.